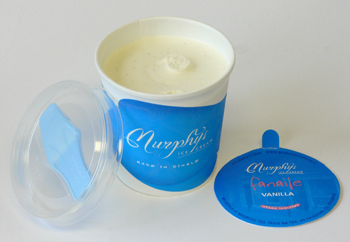 Â We’re very excited here as our new mini containers (125ml) finally arrived, and we’ve filled the first few. It’s amazing how long it takes to get packaging! 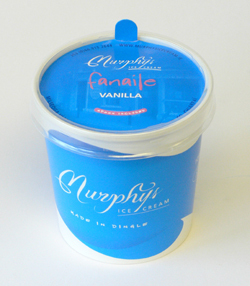 We will do them in a few flavours and these little tubs will be in shops soon. The best thing is that there is a spoon in the lid. The worst thing is that the packaging is expensive, and I think they will around â‚¬3 retail, depending on how much markup retaillers take, which is definitely more than we would have hoped. The little disk is the most expensive part! they look adorable! They might be expensive but then they are very cute. Very sharp. Great packaging. Too bad they’re so expensive! congratulations on your new minis! They look great. I always go for the mini tubs as that they are the perfect portion size. And being in that fancy packaging, all the better! I agree with everyone above – very cute! And given all the hot weather that everyone appears to be dealing with – it sounds like they arrived just in time! I hope you have good success with them.